We are excited to announce that "Sunken Conservation" will begin its television broadcast debut on January 14th at 8:30 on WJCT-TV channel 7.1 and/or Comcast channels 8 & 440. 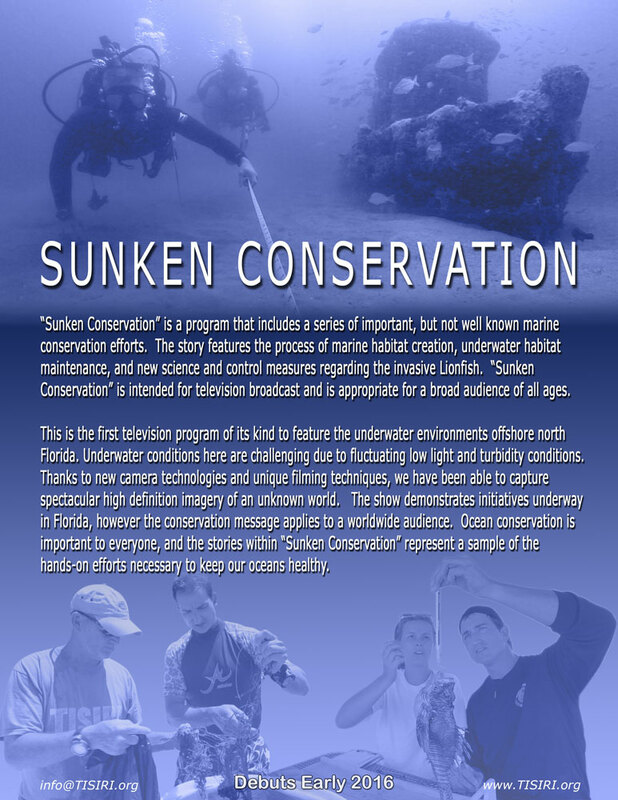 "Sunken Conservation" is a television program that showcases the unique underwater habitats of regions of Florida many are unfamiliar with, and important hands-on conservation initiatives. "Sunken Conservation" has been our most ambitious and involved project to date. It has taken us several years to coordinate and capture all the necessary imagery to tell the important conservation stories featured. You can also catch TISIRI on the Ch 4 (WJXT) morning show on Tuesday January 12th around 8:45am, and on WJCT Radio 89.9FM on January 14th at 9am to hear more about the program and how it was produced. WJXT CH4 News segment is now online click here to view it. We appreciate Guy Harvey's announcement of "Sunken Conservation's" debut! See below which includes additional footage samples from the program. I am so excited to see this. Awesome! I have watched your short movies in the past and looking forward to a full television show. Congrats! Kenny, The debut broadcast is in the north Florida region. It should air in south Florida at a future date. I live in St Johns County and get all Jacksonville channels. Neither WJCT (broadcast 7.1) or Comcast channels 8 or 440 show this programming on Jan 14th at 8:30 PM. My guide shows a program called “Conversation”, a call-in show that addresses Muslim-related issues. I’d love to see it, but you might want to clarify when it is actually going to be on. I tried searching, but no luck. Thanks! I’m recording it on WJXT Ch 7 (Direct TV) their schedule lists it as “Sunken Conversation” from 8:30 – 9:00 pm. Looking forward to it.